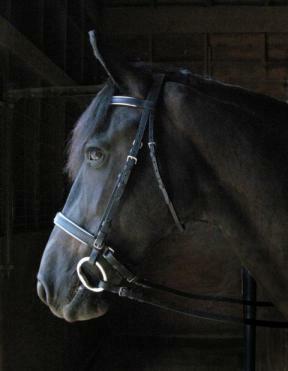 The Concho Dressage Bridle is a stylish dressage bridle with a padded nose, brow, and crown. The Black leather bridle with silver piping on nose and brow has a small silver 3/4"x 3/8" horse ornament at center of the browband. It has a crank style nose. Comes with laced reins. These bridles are made from continental leather from one of the world’s major tanners. Bridles are sold without bits.